Capture the charm and romance of warmer evenings with charming firefly mason jar lights. They’re a quick and easy 2-minute craft and they’re beautiful to behold. Let’s get started! 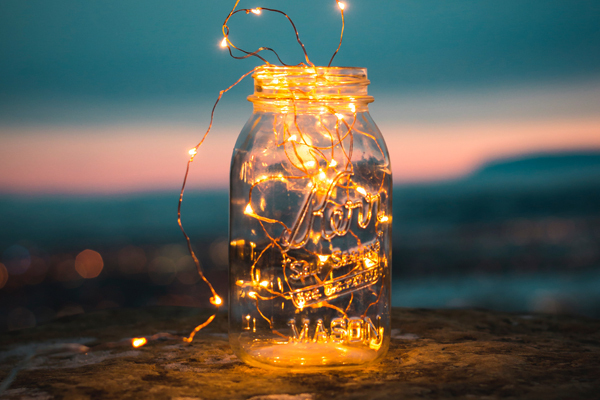 These fairy lights in a jar can be used as part of a large, decorative centerpiece for an enchanting sort of look, alone as ambient light, or even as an energy efficient night light. The possibilities are endless. First, place your sparkling LED lights into your mason jar. Position the battery case outside of the jar so you can easily switch your fireflies on (or off!). Next, seal your jar with the mason jar lid. Finally, add your batteries and switch your light on. Watch your fireflies sparkle! Personally, we like to stagger our firefly lights throughout our fall evening tablescape alongside our favorite DIY rustic centerpiece. The mixture of flickering fairy lights, rustic wildflowers, and other natural materials gives the table setting a sort of rustic, candlelight-during-sunset sort of feel. If you’re looking to make your own firefly mason jar lights, let us know on social by using #mypapermart! We love seeing your creations. Are you on the hunt for more how-tos and DIYs? Keep following our blog for DIY videos, tips for small businesses, product features, and more! I like to buy a big roll of brown paper (I don’t know this item name) to cover the garbage cans for a church event. Also, I used this paper to put over the table cloths to have as a runner. Thanks.